This summer my mother unpacked a very full basket of teeny tiny shells. At the end of every barn visit, she'd invite my daughter to pick a few special ones to take home. 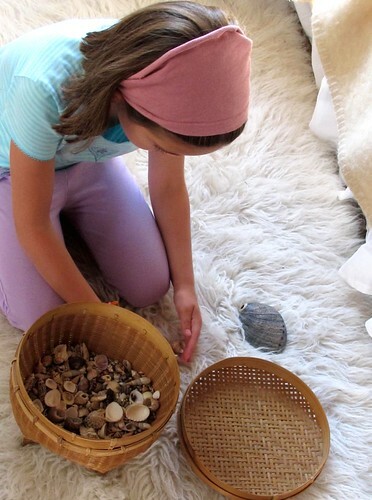 My daughter's fascination with the shell basket led to sorting. Sorting led to identification with this handy book: A Golden Guide: Seashells of the World. A recipe for delighting young children often includes simple and thoughtful activities that increase fine motor skills while stimulating curiosity. This shell collection fit the bill. 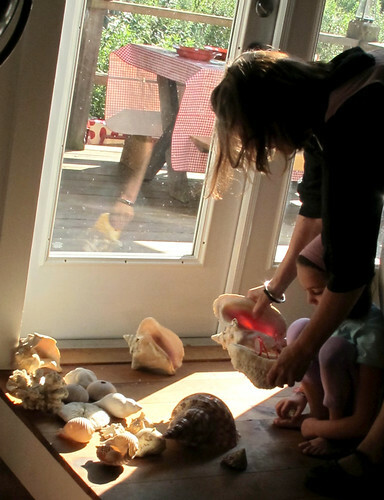 After several shell infused afternoons, my mother whispered "I have some larger ones, you know..." Out to her shed she went and returned with a box of shells anyone would have oohhed and aahhhed over, but imagine the little girl that had been immersed in shells for days. Ecstasy, really. Our next visit was filled with washing and caring for them. As I said, simple and thoughtful. With a tub of slightly soapy water, a little rag, and a drying cloth my daughter proceeded to happily wash shells for much longer than anticipated. Do you have a collection of shells? Set up a washing station: it's worth doing. Soon my mother introduced a little ladle and a glass vase. 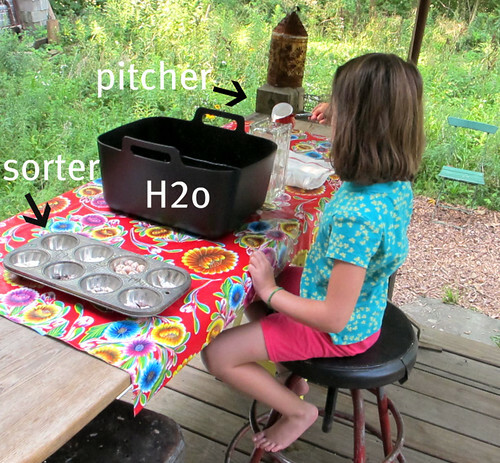 She discarded the soapy water and added clean water to the tub. Carefully, my daughter ladled the water into the vase. She selected some favorite shells and dropped them in gently. 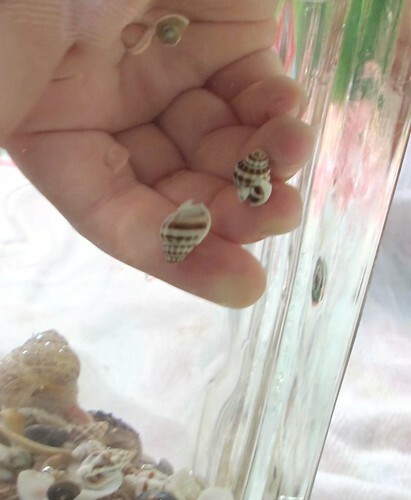 To her surprise many shells gave birth to a little water bubble... like little pearls. 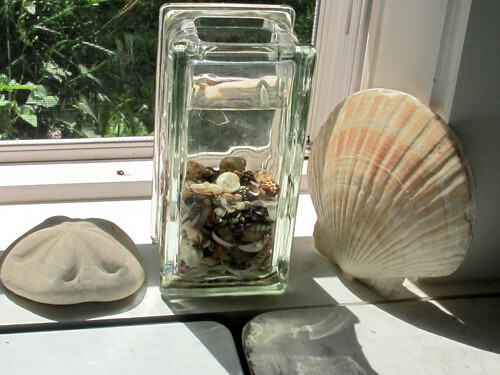 Filling a glass jar (or vase) of shells is something many of us have done. There's a reason... it's like holding a bit of the magical underwater world in our hands. I find it just as captivating now as I did when I was little. 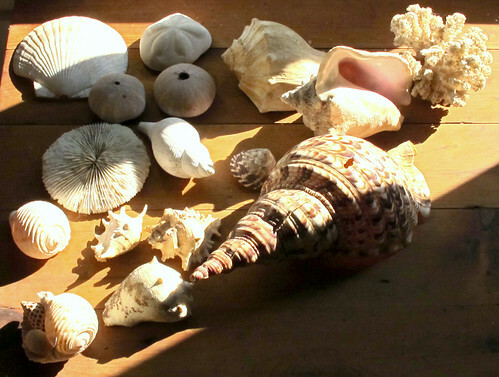 I always associate them with summer, but really you can spend time with shells at any time of year. I love this activity. Seashells always remind me of summer, too. I get tons of inspiration from them while drawing and painting. What a lovely post. I am in the midst of trying to simplify my 4 yr old daughters toys. This is just another reminder that inspiration and inventiveness can be found in many many things, not just plastic from the store. Those are so pretty - love the washing station!!! And don't they always look so much brighter in water!!! Lovely, lovely work!!! It's so lovely that your daughter is drawn to the simple beauty of nature. Thank you for sharing that wonderful story. Now that I live three blocks away from the ocean (yay! ), this would be such a hit in our house..! I feel the same way about rocks. We collected river stones all summer long - and now our porch, shelves, nooks and crannies are full of river reminders! Welcome back! I love this post. There is something so wonderful about the sea, seashells, especially tiny ones. Maya, I love this post that shows the joy to be found in the "little" things of life. Your daughter is fortunate to have such a wise mother and grandmother! I love stopping by for a bit of peace and charm that is maya made. what a lovely and magical post. i love sea shells and the underworld! all the little things really can make kids and adults dream on for hours! Oh yes, once more, beautiful, inspiring post that reminds me of the beauty of it all. Thanks. This looks like so much fun! 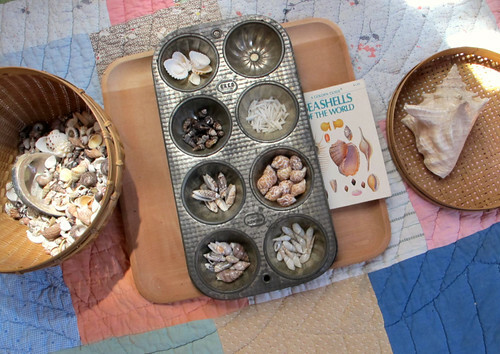 I used to spend hours sorting through my grandmother's button box and my other grandmother's rocks, and lastly, my mother's seashells. Such beauty! 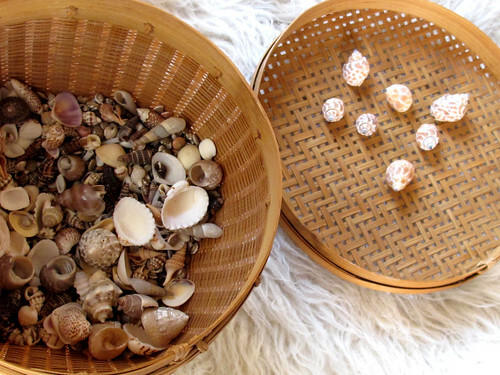 this is beautiful...i have baggies full of shells my little ones have collected from our beach trips..(just had to vacuum up sand off the floor from them yesterday!) thank you for the wonderfully simple idea. Hmm, I think that I still have my old shell collection in the garage. The local beaches are surprisingly / disappointingly scarce. aaahhhh this is so very sweet. love the birth of the bubbles. Your blog is great, you have so many nice ideas. I love the shells and I have a game like that at home, which I really enjoy to play. Your blog gives me a lot of inspiration. I give you a little present on my blog. maya, your blog is pure pure inspiration and delight. THANK YOU! beautiful. 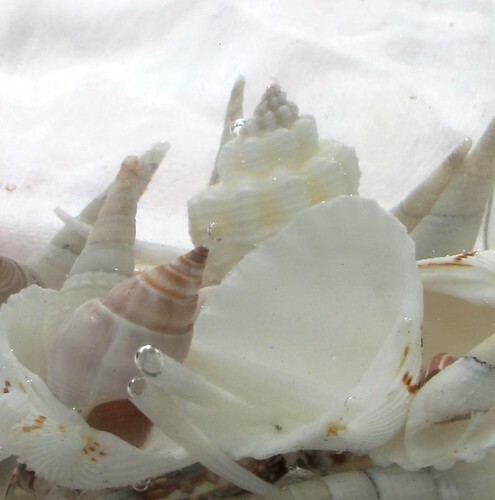 :^) love the shells immersed in water. i have another you can add .. clay. you can use the shells to imprint in the clay, and the clay can be used to roll and shape sculptures of shells. we also did some beautiful drawings of our shells using india ink. setting them out with drawing things and paint can inspire some beautiful work.